CSS Atlanta started life as an iron hulled, schooner, also powered by steam of about 700 tons, named Fingal. Built in Clydebank, Scotland she was launched early in 1861. For a short time she sailed to and from ports in Scotland until she was purchased by a Mr Bulloch in September 1861. Bulloch was an agent during the American Civil war, for the Confederacy. His intention was to use her as a blockade runner, supplying the southern states with much needed military supplies. Most of the ports in the south had at this time been blockaded by the Union forces. The ship was loaded with cargo in early October 1861 and sailed for the Bahamas. But this was not the true destination, the schooner reached Bermuda in early November, and then sailed on to Savannah, Georgia. They managed to get through the Union blockade without being stopped, reaching Savannah on the 12th of November. The plan was to return to Britain with the ship and new cargo; however the Union blockade proved to be impossible to break through. So in January 1862 the ship was handed over to the Confederacy. 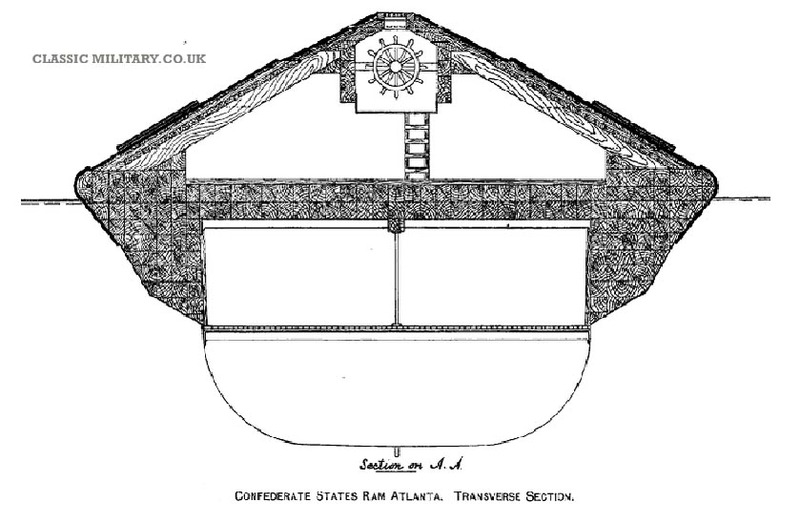 The Schooner Fingal was then converted into an Ironclad in early 1862 and named “Atlanta”. She was cut down and a large angled casemate added, which was made of timber with 2” thick armour plate. The conversion to an Ironclad added about 300 tons to her weight taking her to just over 1000 tons. She was armed with eight Brooke rifles which could fire explosive shells. Some of these had a calibre of up to 7”, three on each side with one forward and one aft. She was also equipped with a ram that protruded from her bow made from iron, to which an explosive charge could be fixed. 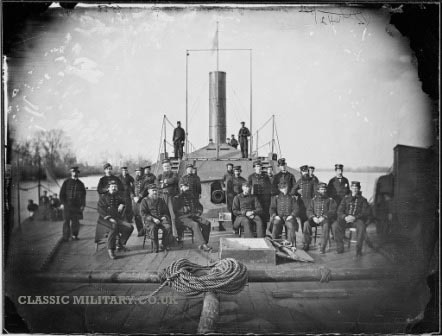 The ship suffered with a few problems at first including bad leaks, but was commissioned in November 1862. In March 1863 the Atlanta attempted to attack Port Royal in South Carolina, but withdrew after it was discovered that the port was protected by Union Monitors. Atlanta sailed again in May, but this did not go as planned. She ran aground, but was eventually pulled free and returned to the harbour. In June 1863 the two Union monitors “Weehawken” and “Nahant” were stationed off Savannah in the Wassaw Sound. It was decided that an attack should be mounted on the two blockading monitors in the early morning. Atlanta attempted to approach them unseen, but was spotted by a crew member of Weehawken. Atlanta fired at the Monitors, but than ran aground. She was unable to free herself as the Union Monitors closed in. The Weehawken opened fire on the stricken ironclad hitting her with a 15” shell. Atlanta fired back missing its targets. Now in an impossible position and taking more hits, the Atlanta surrendered to the Union forces. She was pulled off at the next high tide and taken over by the Union forces. She was then repaired and rearmed with new guns. 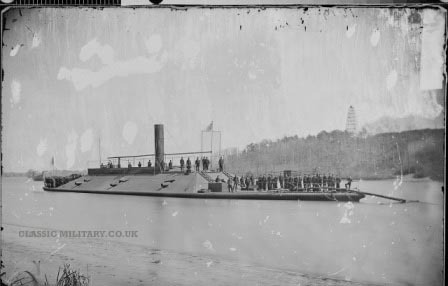 She was now known as the USS Atlanta, and for the rest of the American civil war was stationed in the James River.